It’s a tough business being a kid. You have very little freedom, no money, and no clue. It’s even harder being a teenager – inching closer to a scary-but-thrilling adult realm that’s still just out of reach. Who will you be? How will you get there? Are you prepared? Who will show you the way? If you were like me, you also wondered, “Will I still adore the Smashing Pumpkins when I grow up?” Spoiler alert: I totally do. Every adult loves to ask kids, “What do you want to be when you grow up?” It’s a question kids hate as much as, “How’s school?” After flipping through the limited catalog of career options in my mind (teacher, nurse, actress, veterinarian? ), I finally found my answer: “Happy. I want to be happy when I grow up.” As a teen, I hadn’t begun to dip my toe into the sea of possibilities that awaited me, so I didn’t want to limit myself. Then again, I had no idea where to begin my quest for this elusive thing called happy, and high school was no help. If someone had told me there are hundreds of career paths my love of writing could lead me down – other than “author” – or better yet, shown me, my little teen heart would have exploded. But, since I couldn’t see it, I couldn’t dream it for myself. At Cayenne, there’s something we call Fire in the Belly, and it’s something we believe every child is born with. We see creativity as an energy fueled by a desire, and people who have F.I.T.B. are always hungry to learn more, push themselves farther, and dream bigger. 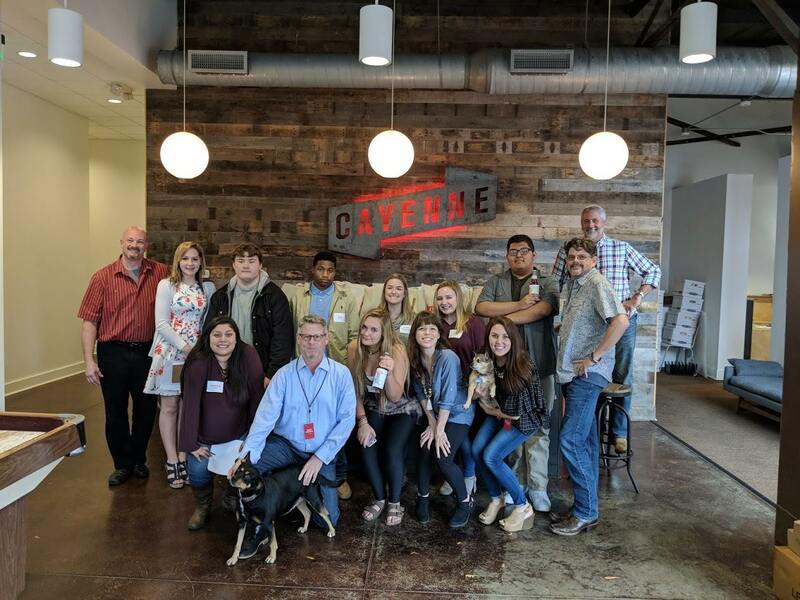 It’s why we believe in the power of fostering creativity in youth, and it’s why we recently opened our doors to host seven Junior Achievement students from The Day Program for Job Shadow Day. 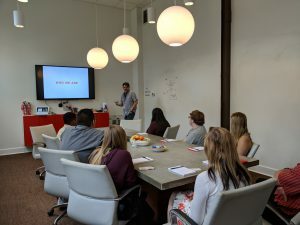 We gave them the grand Cayenne tour (where they were greeted by all the office dogs), introduced them to our team, treated them to lunch, then let them experience a day in the life working at a creative agency. 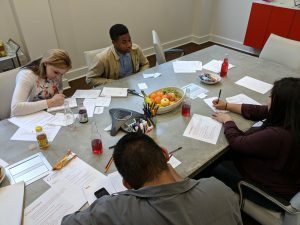 The students worked in groups to take a new soda product from concept to creation, from writing the creative brief, to designing a logo, strategizing the marketing plan, and, of course, presenting to the “client.” Dan Monroe did a great job as “client,” if anyone is hiring. Interested in opening your business to Junior Achievement job shadowing? Reach out to get involved. The folks at Junior Achievement make it easy to coordinate, and you’ll enjoy the satisfaction of knowing you played a role in helping local students discover new paths and possibilities for a bright, happy future.